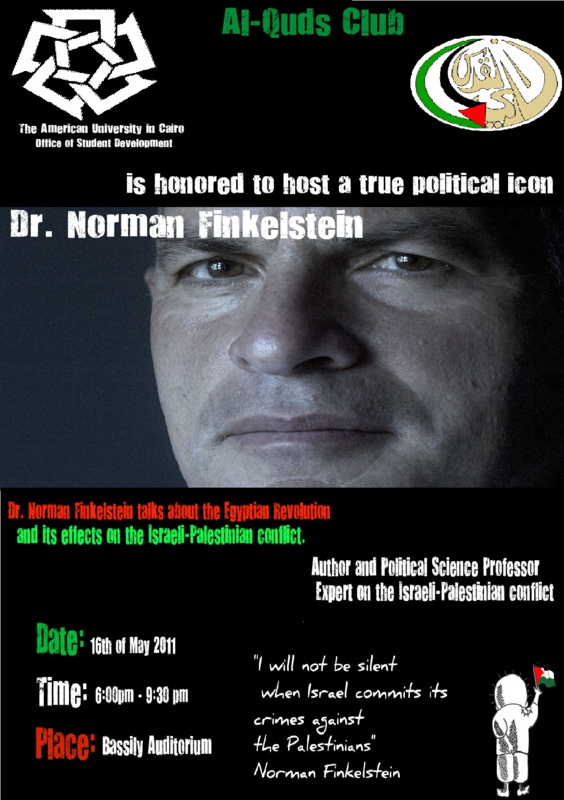 Al Quds Club in AUC is hosting Dr. Norman Finkelstein on the 16th of May at 6 PM at the Bassily Auditorium New Campus. The main theme of the event will be about the Egyptian Revolution and its implications on the Peace Treaty with Israel (how this threatens the peace and security of Israel) and how this in turn will affect the Israeli-Palestinian crisis.The effects of the Egyptian revolution on Palestine, will be stressed upon. · The host of the event will have a short opening statement introducing the event and a brief biography of Dr. Norman’s Scholarly Work. · At 6:30 pm Dr. Finkelstein will be asked to start his lecture. · Questions will run from 8:00 till 9:30 pm. · After this open panel of questions, we will proceed to the reception where we will be serving food and refreshments. Please be feel to come by and share in this event. Maps can be found here. Enter the university from Gate 4- Pepsi Gate. You will receive invitations at the gate upon arrival. Must have one to get in. If you want a seat. Arrive early. First come first serve. Doors close when maximum capacity is reached. Are non AUCians invited too? Any entrance fees? Please guide us to any online map of the AUC campus, showing where the Bassiley auditurium is located? Yes, non AUCians are invited. No entrance fees. I will update my post with the link to the maps. The updated information is that you DO need an invitation if you are a non AUCian. However, these invitations will be handed out at Gate 4 of the university as you come in. A few ushers will be there with the invitation and guide the guests to the hall. thanks for the heads up , if you happen to know at what time will they start handing out the invitations kindly post an update .